Protesters outside Malpani Hospital in Jaipur. 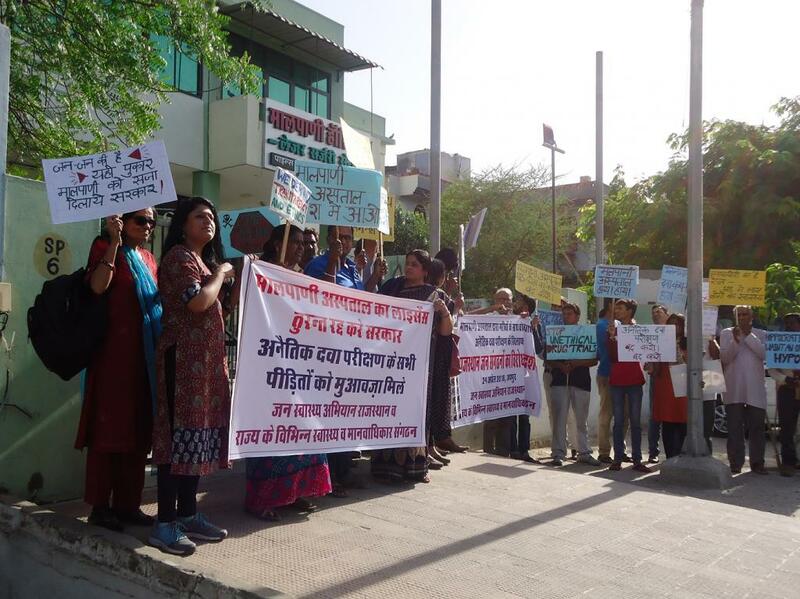 Several rights-based organisations, including Jan Swasthya Abhiyan Rajasthan (JSA), Peoples Union for Civil Liberty (PUCL), ActionAid, BGVS, BARC, Prayas and gathered outside Malpani Hospital in Jaipur on Tuesday and protested against the unethical clinical drug trial that was reportedly carried out by this hospital. Malpani Hospital recently under the scanner after media reported that it was engaged in unethical drug trials conducted in March. So far, the administration has refuted such an allegation despite rights groups throwing their weight behind this issue. The alleged victims of illegal drug trial, who are mostly residents of Churu and Bikaner, claim that they were given certain drug, which led to serious medical complications to them. According to media reports, 19 men from the villages of Churu and Bikaner were ensnared by an agent, promising them employment in Jaipur where their work would be to take care of elderly patients at a medical camp in Jaipur and in return they would be paid Rs 500 per day. Many people from the village were ready to take up this job opportunity but the agent handpicked 19 men under the age group of 35 years. The men were brought to Malpani Hospital and were given medicines, following which they complained of dizziness, loss of consciousness, nausea and inability to urinate. The truth will appear only when the government probes into the allegation. Chhaya Pachauli from Prayas says that it is unfortunate that India is becoming a hub of clinical trials for pharmaceutical companies, a majority of them being transnational corporations. Poor and uneducated people from the countryside are coerced into becoming guinea pigs for a paltry sum of money and in the process they are subjected to adverse consequences without being compensated for them. Malpani Hospital reportedly administered the medicine by the code name GRC27864-201 (expiry date: Aprl 30, 2019) to people of Bidasar area of Churu district. Glenmark, the manufacturer of the drug, is headquartered in Mumbai. Both Glenmark and hospital authorities need to explain why healthy persons were given the drug, when, according to them, it was the second phase of the trial. According to clinical trial protocol, drug is administered to patients suffering from the disease that it is being tested for. Not only a probe is needed to ascertain why these acute symptoms were caused, but also a in-depth investigation is required to find out whether the adverse effects are just symptomatic or have caused more serious damage to body organs which will only be known after some gap, says the statement issued by these groups protesting against the trial. While reports emerge that Glenmark has withdrawn the trial from Malpani Hospital, protesters say that the withdrawal of drug trial from the hospital is just not sufficient as the same drug is being tested in other centres and similar kind of enrolment of healthy human beings might have happened with similar kind of acute complications. The complicity of Glenmark in promoting unethical trials cannot be ruled out unless investigations are done at all the centres and therefore, Glenmark is equally responsible for this offence committed.